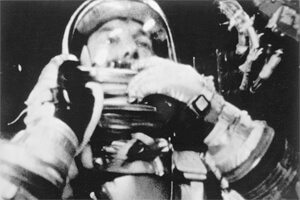 On this day exactly 50 years ago, in 1961, Alan Shepard, Jr. became the first American to be sent into space by NASA, solo piloting his Mercury Freedom 7 capsule 116 miles into space. Ten years later, Shepard commanded the Apollo 14 lunar mission and became the fifth person to walk on the moon, where he famously hit two golf balls with a six iron. The title of Magic of Orlando's 1996 production, "Twelve Seconds to the Moon," referred to the length of the Wright Brothers' first flight of a powered airplane at Kitty Hawk, N.C. on Dec. 17, 1903. The show concluded with a lift-off through the clouds (marked by white flags) of the rocket that sent later American astronauts to the moon. The corps portrayed the spacecraft entering the darkness of space with contrasting black flags.